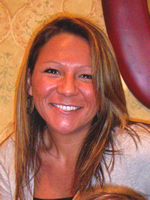 Dr. Kali LaRue has treatment hours at Greater Rochester Clinic. Contact Star Physical Therapy to schedule an appointment at 585-425-1018. Kali LaRue received her Doctorate of Physical Therapy from University at Buffalo in May of 2007 and has been a member of the STAR team since June of that year. She is a member of the APTA and certified as a clinical specialist in Orthopaedic Physical Therapy (OCS) by the American Board of Physical Therapy Specialties (ABPTS). In addition, she is involved as an adjunct faculty member of Nazareth College and has served as a clinical instructor for many student clinical rotations. Also, she is a participant in the pilot “Primary Spine Care Specialist” training sponsored by Excellus BCBS. Her professional interests include orthopedic injury, manual therapy, Pilates-based rehabilitation, and health promotion. She is also an accomplished athlete having been a member of UB’s Division 1 crew team for four years and currently participates in marathons, local races, and bike tours. Contact Star Physical Therapy to schedule an appointment with Kali LaRue at (585) 425-1018 or check out the Star Physical Therapy website.